Virtual HDTM is the premier product in VDI’s voice integrated training portfolio designed specifically for corporate fleets of any size. Virtual HD is a voice controlled, interactive simulation-based driver safety program designed to improve hazard recognition skills, lower accident rates and reduce distracted driving. This unique driver training program focuses on eliminating the primary reason why drivers become involved in a crash: a failure to recognize and react to hazardous driving situations. Virtual HD is simply better training in less time. Simulators have been used for several decades in aviation training, both commercial and military. Air Force, Marine Corps, the Army and Navy have trained their airmen, sailors and soldiers in the rules of engagement, judgment, combat, marksmanship and indirect fire on simulators. Before pilots fly the world’s most advanced fighter jets, they fly first on simulators. Helicopter pilots benefit from simulator technology by improving their overall readiness at an earlier stage of their rotary wing training. Simulation provides for reduced costly flight hours and improved safety and training outcomes. Emergency vehicle operators use simulators to learn safe driving maneuvers in emergency response situations without endangering themselves or the public. Each is completely safe, because they can crash on a simulator, and live through it. Each is more technically proficient, safer and mission-ready. 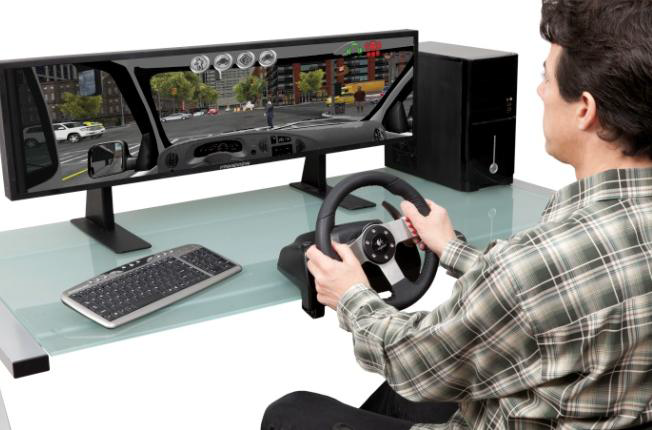 Do Simulators Provide Effective Training for Drivers? Yes! Recent research has investigated the training benefits that driving simulators provide. there is compelling evidence that simulator-based instruction provides a high transfer of learning rate on new and experienced drivers. Moreover, it has been proven that making mistakes is a key dimension to learning. Flach et al. (2008) stated: “This is likely to be one of the values of simulators – they offer an opportunity to learn from mistakes in a forgiving environment”1. “AAA Foundation for Traffic Safety has recently sponsored a research program on evaluating driver education programs Lonero and Clinton). Although specifically aimed at commercial driving training enterprises, early data indicate that well designed CBI, including simulation, can improve student performance.” Large-Scale Evaluation of Driver Education view of the Literature on Driver Education Evaluation 2010 Update. Lawrence Lonero, Northport Associates, Dan Mayhew/Traffic Injury Research Foundation for the AAA Foundation for Traffic Safety. “In these days of high-priced fuel, simulators provide a cost- effective solution to initial driver training. Besides financial benefits, simulators offer great opportunities for carrying out objective measurements on the user’s actions in a safe and purpose-developed virtual environment (Vlakveld, b).” Dr. Ir. Joost C. F. de Winter, Department BioMechanical Engineering, Delft University of Technology, The Netherlands. “Another study reviewed the effectiveness of simulator based training. The Texas Association of Counties had goals of using a simulator to reduce auto liability and workers’ compensation claims. After training 2,000 law enforcement, road and bridge truck drivers and other county drivers, they have reduced auto liability claims by 55%. Additionally, they reported an 18% reduction in occurrences for the 21-month period since using simulator-based training.” Preliminary Results – Simulator Based Training to Reduce Costs. Paul Hoff.